This top of the line polymer AR-15 magazine from MagPul offers strong construction in a 30 round capacity. It offers a snap on polymer cover with a round count viewing window. These time tested .22LR magazines are built to last. Works with almost any .22LR CMMG conversion kit for the AR-15. Magazine is Polymer Grey with Green Followers. These Mini-14 magazines are well constructed of reinforced polymer with aggressive horizontal ridges provide increased gripping surface for insertion and extraction of the magazine in wet or muddy conditions. Includes a heavy duty spring and an anti-tilt follower.30 Round for .223. Blued steel finish, 30 round .223 Magazine for the Mini 14. 30 Round AR15 .223/5.56, Mil Spec, Stainless Steel, Tan Finish, magazine body, dry lube coated chrome silicon spring, with mil spec followers. 30 round magazine. 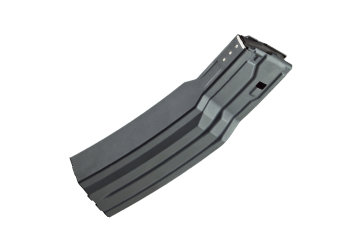 AR-15 30 Round Steel, HK Style Coated magazine for .223/5.56. KCI AR15 .223/5.56 100 Round Gen 2 Drum. Polymer drum. Includes black storage bag, loader, & 1 bottle of graphite lubricant. MagPul P Mag D-60 round AR 15 .223 Drum. weighs 1.3 ounces unloaded. Low profile, easy to load, capacity window, easy to disassemble for cleaning. Surefire 60 round AR-15/M16 magazine. (2) in stock, please call before ordering.